How can I send an email right now? Creating a dedicated email campaign through Cerkl makes it easy to design and send specific messages to your entire subscriber list or just a segmented group! A dedicated email is used when you need to send out important information that is more immediate and demands more attention than a traditional newsletter story. For example, a closure due to snow, can't wait to go into next week's automated Cerkl newsletter so we need to get that out ASAP. To create a dedicated email campaign, go to Dedicated Email > Create Email. Start by creating a Name (pro tip: your administrators are the only ones who will see your Campaign Name). In the example below, Cerkl wants to send news about their Insights Update, but our subscribers would have no idea what that means. "Reply To" Name and Email will automatically be set at your Cerkl default. If you are looking to add a personal touch, you always have the option to change the "Reply To" Name and "Reply To" Email, so it's associated with a specific member of your team, for example, the President of your organization, or a specific Sales Representative. Subject Line is the email subject that all of your subscribers will see popping up in their inbox. This should be a nice click-bait tagline, "Exciting New Update Coming Soon!" sounds far more exciting than "Insights Update". Now, when do you need to get this important notice out to your subscribers? You have the option to send your dedicated email on a specific date and time or send immediately. By changing the Send At field, you are able to maintain control. The Audience section helps you decide who receives this specialized message. Segments are subscribers that belong to a specified group you've created under your Cerkl Settings. Don't already have Segments setup in your Cerkl Settings? No worries, you can simply skip this field! Interests help you decide who on your list is actually interested in hearing about this message. For example, for our Insights campaign example, we only wanted to notify those subscribers who are interested in Golf. Targeting shows you how many total subscribers in your projected audience will receive your dedicated email campaign. Include as many Segments or categories as you'd like to get your message across. By clicking the blue Preview link, you can the scan your target audience by name and email address to make sure you've got everyone! Now to the important stuff, you can build your own template or load one of your saved templates to create your email content! After designing your campaign, you can send yourself a preview to get a sneak peek at your custom content. 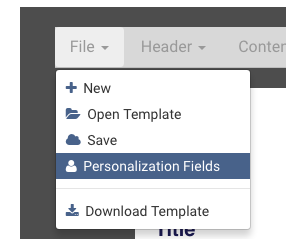 Don't forget you have the option to drag, drop and even delete additional Header Fields, Content Fields or Footer Fields that will automatically match your organizational branding! We all know, personalization is key, so check out your campaign personalization options by selecting File > Personalization Fields. Now you can automatically enrich your message with a subscriber's First Name, Full Name or Email Address - Because one size doesn't always fit all.. duh! Now that we've got all that covered, it's time your audience sees your new dedicated campaign. Select Save to deliver on your specified day/time.